Thanks to Janice at Ferdinand’s Familia, Alabama has found a new home. 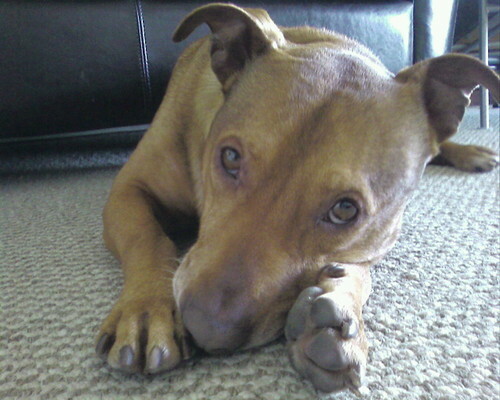 Taking her place is the energetic Pit/Terrier mix Hero. He was taken in after the caretakers at the SPCA noticed, after having been in their care off and on since September, that Hero was becoming increasingly distressed with confinement to the point that he had become unmanageable and was perceived as a threat to the staff. Only 2 days out of the slammer and he’s nearly unrecognizable in behavior and temperament from that distressed and unhappy dog. 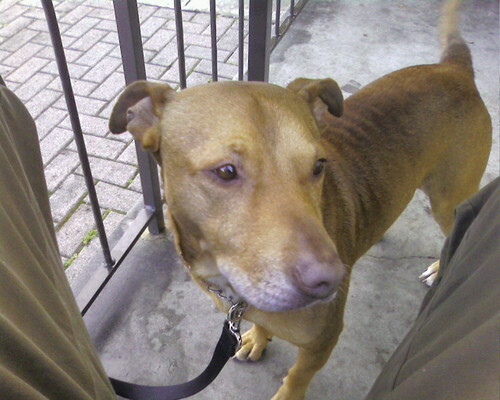 This is a adorably homely, energetic, mature dog with a surprising capacity for learning. After only a few times out on the leash, with dilligent corrections and positive reinforcement, he’s ceased pulling and is able to heel while keeping a slow, medium or fast pace with me. This dog loves exercise and the promise of an adventurous walk is incentive enough for him to behave. With his ample energy, I’ve found a slow jog, slow enough that he’s not running (as he has a tendency to run ahead) but fast enough to promote a speed walk (more difficult for a dog of his proportions to maintain), works best to keep his attention and limit the need for correction. 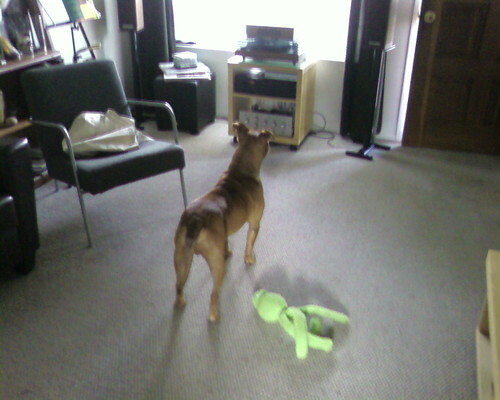 Afterward, he’s more attentive to changes of direction and pacing, and less inclined toward distraction. We tend to start out slow, with plenty of stops to wiz and read the doggy news, moving up to a brisk walk and finally the slow jog home. Evening walks are more low key as he’s a bit more tentative in the dark and more willing take a slower pace. At least two outings a day with some fun play time in between seems to be what this dog needs, at a minimum, to be happy. He would do well with someone who appreciates an active lifestyle, is calm and willing to be assertive with him, and could benefit from this sort of regular physical regimen. Homework for this week will involve reinforcing his name, staying and coming when called. Following that we’ll work on socializing. My neighborhood of South Park provides ample opportunity to meet other dogs, and most are well behaved and well handled. Unfortunately, it’s apparent this dog has been abused in the past as he show signs of being hand-shy and will yelp and sometimes mouth to defend himself when afraid or injured. I imagine this is common with energetic and strong dogs who are paired with irresponsible and likely ignorant owners. My hope is that with care and positive reinforcement, these fearful habits will dissipate with time. This is a loving and devoted dog and is certainly worth the patience.